According to the data and stats that were collected, 'KAIST WHAT'S ON' channel has a poor rank. The feed was last updated more than a year ago. 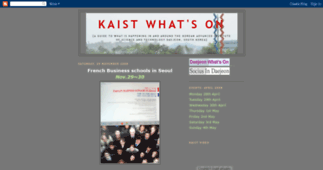 In addition 'KAIST WHAT'S ON' includes a significant share of images in comparison to the text content. The channel mostly uses medium-length articles along with sentence constructions of the basic readability level, which is a result indicating a well-crafted news inventory on the channel. 'KAIST WHAT'S ON' has mostly short articles at the moment, however, they might have a great potential to develop their materials and quality in future. 'KAIST WHAT'S ON' provides texts of a basic readability level which can be quite comfortable for a wide audience to read and understand. 'KAIST WHAT'S ON' contains texts with mostly positive attitude and expressions (e.g. it may include some favorable reviews or words of devotion to the subjects addressed on the channel). Unfortunately KAIST WHAT'S ON has no news yet. [Clubs] KAIST Formula SAE Team "K-Alpha"